TLW 27. Readings set for Sunday, July 8 (Revised Common Lectionary). “Your own flesh and blood” – Despite a separation between Judah and the northern tribes, they still had a strong sense of kinship. Under David, they came together. David had been made king over Judah by his tribe, and over Jerusalem by conquest. His kingship over the northern tribes came by covenant, or treaty. This was the third time David was anointed. 4-5 David was thirty years old when he became king, and he reigned forty years. In Hebron he reigned over Judah seven years and six months, and in Jerusalem he reigned over all Israel and Judah thirty-three years. 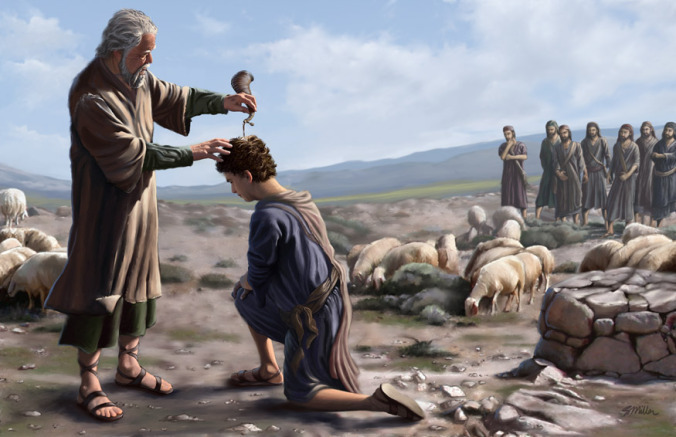 “When he became king” – David had been anointed by the prophet Samuel as a youngster, 15-20 years earlier. His God-fearing leadership had been seen by all. The tribal elders had been very slow to recognise the working out of the Lord’s ‘shepherd of Israel’ word, when the crowning actually took place. 9-10 David then took up residence in the fortress and called it the City of David. He built up the area around it, from the terraces inward. And he became more and more powerful, because the Lord God Almighty was with him. David has gone north to Jebus which was a terraced area south-east of the modern city and below the rock, or stronghold that became the rebuilt City of David, Jerusalem. It was a strategic move: central, naturally fortified and between Judah and the northern territories. In practice David was anointed for high office as a teenager – and then had to live with that call on his life, being faithful to God in the face of much public dishonour, even being treated as an outlaw. It was about 20 years many years before even his own tribe recognised his leadership in Judah, and then another wait before he could bring the northern tribes on board. Later he was to write, Psalm 18:25, “To the faithful you show yourself faithful…” Was he faithful? He made mistakes, even serious mistakes like sending Uriah to his death, but he recognised his faults and learned from them, and was revered as a good and godly king who established just rule, the way God wanted. The lesson for us is that our loyalty and trust of God will be tested, and He allows this testing to be like a blacksmith’s heating and hammering, to forge strength and relience. Question When you feel you are being dishonoured, where are you between blaming God for not standing by you, or accepting the test that strengthens, knowing that God is faithful? The Twelve are empowered and sent out in twos to minister in the villages. 1-3 Jesus left there and went to His hometown, accompanied by His disciples. When the Sabbath came, He began to teach in the synagogue, and many who heard Him were amazed. Probably the same event as Luke 4:16-30 where Jesus reads the beginning of Isaiah 61: “The Spirit of the Sovereign Lord is on Me, because the Lord has anointed Me to proclaim good news to the poor…” (etc). “Where did this man get these things?” they asked. “What’s this wisdom that has been given Him? What are these remarkable miracles He is performing? “Isn’t this the carpenter? Isn’t this Mary’s son and the brother of James, Joseph, Judas and Simon? Aren’t His sisters here with us?” And they took offence at Him. “Isn’t this the carpenter?” – people had known Jesus in His ‘ordinary life’ prior to His baptism. To them, He is ‘just a carpenter’ and, implied in “Mary’s son”, of illegitimate birth, unlike his brothers and sisters. “Took offence” – in Luke’s account, serious offence, as the crowd hustled him to the brow of the town hill and tried to push him over the edge. 4-6 Jesus said to them, “A prophet is not without honour except in his own town, among his relatives and in his own home.” He could not do any miracles there, except lay His hands on a few sick people and heal them. He was amazed at their lack of faith. Then Jesus went around teaching from village to village. “Without honour” – this rejection in Nazareth (the last time in the Gospel where Jesus is associated with a synagogue) is a small version of the much greater rejection to come in Jerusalem. The dishonour shown to him results in a lack of fruit there. 7 Calling the Twelve to him, He began to send them out two by two and gave them authority over impure spirits. “Two by two” — the OT requirement for ‘authority’ was two witnesses, Numbers 35:30, Deut. 17:6, 19:15, Matt. 18:16. Spiritual authority over spiritual iniquity or “impure spirits” would be needed on the mission. “Authority over impure spirits” – the proclamation of God’s kingdom comes in actions and deliverance, including healing, not just words (vv.12-13). Nazareth had proved to be hard-hearted and scornful with only a “few sick people” healed. This was a lesson to the disciples, to discern which people were open to God by seeing who would welcome them and by receiving their hospitality. 12-13 They went out and preached that people should repent. They drove out many demons and anointed many sick people with oil and healed them. “That people should repent” – not so much a ‘hard message’ as God working through the disciples. Proclaiming and showing the goodness and grace of God results in willing change of hearts and lives – repentance – among those who receive the Good News. In practice With the revelatory insights that Jesus possessed, the “wisdom that had been given Him”, it is hard to imagine Jesus being amazed at the rejection and lack of faith he experienced in his hometown. He both demonstrated and explained who He was – the signs of the kingdom in His ministry left little doubt of that – but those who had known him as a carpenter/builder were scornful, asking him who He, just a regular working man like them, thought He was. Often it is those near and dear to us, and those who we would naturally expect to be affirming us, who can present the most difficult opposition. Becoming a Christian by asking Jesus into our lives does change us and does make us seem different – progressively more like Him! And that can be threatening to others. But if Jesus was so dishonoured and rejected, should we be upset if we experience a little of the same? Question If Jesus gave His first disciples authority over evil spirits, how are we to view a life made miserable with a spiritual dimension to it? 2 I know a man in Christ who fourteen years ago was caught up to the third heaven. Whether it was in the body or out of the body I do not know – God knows. “Third heaven” – not the atmosphere where birds fly, and not the higher ‘heaven’ of sun, moon and stars, but the unseen realm of God’s uncontested presence, the place of blessedness where God dwells, referred to in the NT as paradise, Luke 23:43, Rev. 2:7. Jesus is “exalted above the heavens”, Hebrews 7:26. 3-4 And I know that this man – whether in the body or apart from the body I do not know, but God knows – was caught up to paradise and heard inexpressible things, things that no one is permitted to tell. Paul had a vision or visions of such unusual intensity he was reluctant to talk about his experience, using the third person as a way of avoiding appearing boastful about something that was God’s initiative. 5-7a I will boast about a man like that, but I will not boast about myself, except about my weaknesses. Even if I should choose to boast, I would not be a fool, because I would be speaking the truth. But I refrain, so no one will think more of me than is warranted by what I do or say, or because of these surpassingly great revelations. “Thorn in the flesh” – the meaning of this is disputed. Many commentators explain this by a physical affliction like malaria or migraine attacks. However, the phrase is used in the OT of a personal enemy, Numbers 33:55, Ezek. 28:24 and Paul had persistent opponents – and often quoted the Hebrew Scriptures (or OT to us). “Three times” – like Jesus’ threefold prayer, Mark 14:32-41, a way of saying that he has prayed to completion and received his answer. 9b-10 Therefore I will boast all the more gladly about my weaknesses, so that Christ’s power may rest on me. That is why, for Christ’s sake, I delight in weaknesses, in insults, in hardships, in persecutions, in difficulties. For when I am weak, then I am strong. The Corinth church had a problem with self-appointed and self-congratulatory leaders, who considered themselves more polished speakers than the small, bald Jewish man who had introduced them to Christ. Paul, by contrast, wouldn’t let anything, any ‘success’ of man, get in the way of his utter focus on Jesus as Lord. Divine power only finds its expression in our human weakness and recognition of the need of the Lord’s empowerment — Paul is forthright about his need of help. In practice This passage can present difficulties in reading it, because Paul uses an elaborate language and style to try to insulate the person, Paul, from being defined by an astounding and life-changing spiritual experience. As if the blinding vision on the Damascus road wasn’t enough… Paul’s point is that it is all about God and not about him, all about what God does, not what he does, and all the dishonour and difficulties simply serve to beat down any sense of human pride and self-sufficiency. Boasting about our weaknesses doesn’t seem so counter-intuitive in the context of God needing a clear and therefore humble channel for His grace to flow. And God’s way of clearing the channel seems a little less unreasonable! Question Could you give an example of God’s strength being able to work, as a result of your own obvious absence of strength? p class=”p6″>Prayer Lord, I hate being mocked and dishonoured, not to mention all the other kinds of spiritual opposition. But I want to learn to pray with authority, to minister to others You may send me to and to bless others with a growing sense of Your kingdom order and peace in their lives. Help me to trust You more, and become more resilient and Jesus-like, as I learn to see the tests of life from Your perspective. In Jesus’ name I pray, Amen. 1 Now the Philistines gathered their forces for war and assembled at Sokoh in Judah. “Sokoh” – The Philistines encroached on Israelite territory through Saul’s reign, here about 15 miles on the Philistine (west) side of Bethlehem. They faced each other on opposite hills across a strategic valley, the Elah, which offered the Philistines a route into the hill country of Judah. 4 A champion named Goliath, who was from Gath, came out of the Philistine camp. His height was six cubits and a span. “A champion” – in ancient times it was sometimes agreed that a stand-off would be settled by selected individuals; see another instance in 2 Sam. 2:12-17. Gath and some other Philistine cities were known for having a number of giant inhabitants. Goliath, more than nine feet tall, would have presented a terrifying spectacle. 5-7 He had a bronze helmet on his head and wore a coat of scale armour of bronze weighing five thousand shekels; on his legs he wore bronze greaves, and a bronze javelin was slung on his back. His spear shaft was like a weaver’s rod, and its iron point weighed six hundred shekels. His shield bearer went ahead of him. “Five thousand shekels” – 55kg or 125lb. This is more than the weight of the massive plate armour worn by medieval jousting knights on horseback. His spear tip was like wielding a large sledgehammer at 7kg. 10-11 Then the Philistine said, “This day I defy the armies of Israel! Give me a man and let us fight each other.” On hearing the Philistine’s words, Saul and all the Israelites were dismayed and terrified. “Dismayed and terrified” – the intention of this strategy. It was Saul’s job to accept the challenge and step forward. “Bring back some assurance” – literally, take their pledge. Of course Jesse was concerned about his sons. 20-21 Early in the morning David left the flock in the care of a shepherd, loaded up and set out, as Jesse had directed. He reached the camp as the army was going out to its battle positions, shouting the war cry. Israel and the Philistines were drawing up their lines facing each other. “Army going out” – ‘Standing to’ at dawn and moving forward from the camp. 22-23 David left his things with the keeper of supplies, ran to the battle lines and asked his brothers how they were. As he was talking with them, Goliath, the Philistine champion from Gath, stepped out from his lines and shouted his usual defiance, and David heard it. “Defiance” – not just cursing Israel, but the living God. 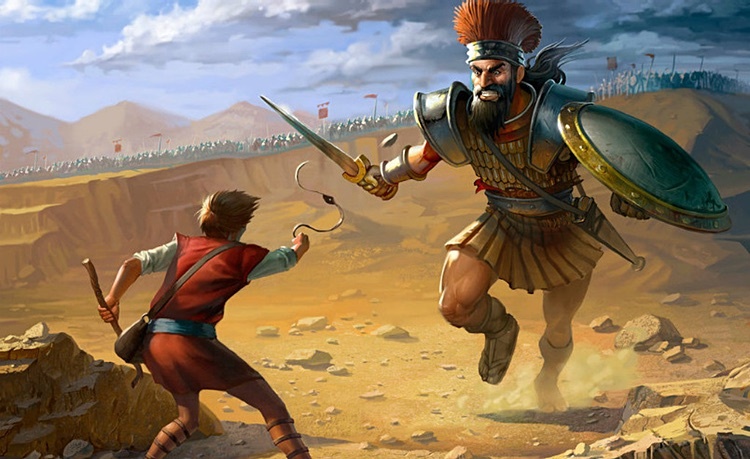 Silencing Goliath’s defiance of God was a greater motive for David than Saul’s offer of reward, vv. 24-26. In contrast to Saul’s fear, verse 11, David has courage – the courage of faith, verse 37. 34-36 But David said to Saul, “Your servant has been keeping his father’s sheep. When a lion or a bear came and carried off a sheep from the flock, I went after it, struck it and rescued the sheep from its mouth. When it turned on me, I seized it by its hair, struck it and killed it. Your servant has killed both the lion and the bear; this uncircumcised Philistine will be like one of them, because he has defied the armies of the living God. Lions and bears were common in Palestine in this period. 38-39 Then Saul dressed David in his own tunic. He put a coat of armour on him and a bronze helmet on his head. David fastened on his sword over the tunic and tried walking around, because he was not used to them. “I cannot go in these,” he said to Saul, “because I am not used to them.” So he took them off. 40 Then he took his staff in his hand, chose five smooth stones from the stream, put them in the pouch of his shepherd’s bag and, with his sling in his hand, approached the Philistine. Between the opposing armies was a valley – and a stream. “Come at me with sticks” – David appeared weaponless, apart from his staff. “The Philistine cursed…” – By contrast, David praised. Victory over Goliath would demonstrate God’s victory over Dagon, chief god of the Philistines. 45-46 David said to the Philistine, “You come against me with sword and spear and javelin, but I come against you in the name of the Lord Almighty, the God of the armies of Israel, whom you have defied. This day the Lord will deliver you into my hands, and I’ll strike you down and cut off your head. This very day I will give the carcasses of the Philistine army to the birds and the wild animals, and the whole world will know that there is a God in Israel. “The battle is the Lord’s” – a declaration of faith and praise. David is choosing to agree with the perspective that the Lord is showing him, over his apparent great disadvantage. To David, this is a spiritual battle, not just a physical one, see Eph. 6:12. 48-49 As the Philistine moved closer to attack him, David ran quickly toward the battle line to meet him. Reaching into his bag and taking out a stone, he slung it and struck the Philistine on the forehead. The stone sank into his forehead, and he fell face down on the ground. David’s sling would have been a leather cup with two thongs to whirl it. Loosing one thong at the right time released the projectile which stunned Goliath so that David could decapitate him. With practice, this could be a highly accurate weapon. It is easy to see this as just a heroic battle, the youth who defeats the bully. However, note that David saw this as the Lord’s battle – spiritual as much as physical. So should we. We face ‘goliaths’ of fear and hopelessness and bad news which the enemy of our souls brings out, to taunt us and challenge us. The battle takes place in our thought life, but we can speak out praise of the One who has settled that battle like David did – and see how that praise becomes a slingshot in the face of the ‘giant’. What has the Lord already provided for your present thought-battle? 35-36 That day when evening came, He said to His disciples, “Let us go over to the other side.” Leaving the crowd behind, they took Him along, just as He was, in the boat. There were also other boats with Him. In 1986 a 26 ft boat big enough to hold 15, dating from this first century period in Galilee, was recovered from mud that had preserved it. “A furious squall” – the Sea of Galilee is 200m below sea level, giving rise to strong downdraughts and sudden storms. “On a cushion” – probably one of the bags of ballast sand used to stabilise the boat. 39 He got up, rebuked the wind and said to the waves, “Quiet! Be still!” Then the wind died down and it was completely calm. Jesus’ exercise of authority over the natural power of wind and waves demonstrated who He was. “No faith…terrified” – the disciples had seen Jesus’ authority in action many times but still lacked faith. The Holy Spirit was to transform their faith and confidence later. “Wind and waves obey” – they knew that in the OT, God commands wind and waves, Job 12:15 and 28:25, Psalm 107:25-30. For further study on Jesus’ authority witnessed by the disciples, see Mark 1:21-34, 1:40-45, 2:1-12, 3:1-5. Just as we face ‘giants’ of fear, so there are storms of life. One tries to slay us, the other threatens to swamp us. But Jesus rebuked the wind – “Do not do this!” and ordered the rough sea to be calm. “But that was Jesus!”, you say. But the implication of the story is that the disciples should have exercised their faith and spoken authoritatively to the elements. And we have the Holy Spirit, the very presence of Jesus, in us to raise faith and bring the right words. When trouble threatens, do you have a person you trust you can turn to, and pray with you? Why is it important to have a prayer partner you can call? “Receive God’s grace in vain” – e.g. by turning back and continuing to live independent from God and self-centred. Or still under a burden of condemnation. Or, as below, showing the very opposite of God’s nature. Saved, but not living as having been saved. “Time of My favour” – Paul, by quoting Isaiah 49:8, is aligning his apostolic ministry with Isaiah’s prophetic call to repentance in view of the coming day of redemption and judgment, which is salvation. I tell you, now is the time of God’s favour, now is the day of salvation. “Now is the time” – This salvation era has already arrived in Christ. God is starting to bestow blessings of the age to come and there is an urgency to turn to God by receiving Jesus in this period of particular favour, between Jesus’ first and second comings. 3 We put no stumbling block in anyone’s path, so that our ministry will not be discredited. Paul and his companions’ character was always being questioned. Slander was their travelling companion – “genuine, yet regarded as imposters”, below. 4-10 Rather, as servants of God we commend ourselves in every way: in great endurance; in troubles, hardships and distresses; in beatings, imprisonments and riots; in hard work, sleepless nights and hunger; in purity, understanding, patience and kindness; in the Holy Spirit and in sincere love; in truthful speech and in the power of God; with weapons of righteousness in the right hand and in the left; through glory and dishonour, bad report and good report; genuine, yet regarded as impostors; known, yet regarded as unknown; dying, and yet we live on; beaten, and yet not killed; sorrowful, yet always rejoicing; poor, yet making many rich; having nothing, and yet possessing everything. “Dishonour…bad report…regarded as imposters” – there was continual opposition from false apostles who in character were self-serving and self-promoting. By contrast, “as servants of God” Paul always puts the focus of his gospel message on the Lord and God’s power coming through his own weakness. The apostolic team’s genuineness is shown by their “yet we live on” attitude of following God’s call. The nine hardships listed (see also 2 Cor. 4:7-18) are also detailed in Acts e.g. Acts 14:5-6, Acts 14:19-20, Acts 16:19-24, Acts 21:30-36. For further study: imprisonments are mentioned in Acts 16:3, Eph. 3:1, Phil. 1:13-14, Col. 4:18, 2 Tim 1:16, Philemon 1. 11-13 We have spoken freely to you, Corinthians, and opened wide our hearts to you. We are not withholding our affection from you, but you are withholding yours from us. As a fair exchange – I speak as to my children – open wide your hearts also. The self-appointed leaders at Corinth have tried to persuade the people there that Paul does not really love them. Unswerving despite the hostility, Paul asserts his true affection, also in 2 Cor. 7:2. Paul suffered a lot for his faith in pursuing his being called to share what the Bible calls the Good News: forgiveness with God, new life and eternal salvation, all through simply turning to Jesus Christ and asking Him to be Lord of your life. It’s a decision that totally changes us – yet the people who were trying to discredit Paul and stir up trouble for him, were often part of the churches he had started. Jesus had said, you will know a tree by whether its fruit is good or bad. Paul kept on loving people in Corinth who were clearly not motivated by love themselves. In the Christian walk, the most bitter opposition may come from within the church, not outside it, and it may be triggered by doing what is right in God’s sight – keeping Jesus central – not what is wrong. Be encouraged, it has happened to many better people who made a stand for Jesus Christ and His values. Giants threaten us, storms of life blow up out of nowhere and attacks come from people who should be there for us – but God’s providence is over all. His kingdom purpose prevails. What is this passage teaching you about opposition and spiritual attack? 34-35 Then Samuel left for Ramah, but Saul went up to his home in Gibeah of Saul. Until the day Samuel died, he did not go to see Saul again, though Samuel mourned for him. And the Lord regretted that He had made Saul king over Israel. “Ramah… Gibeah” – it was a separation but archaeology has revealed that Ramah and Gibeah were only a few miles apart. “The Lord regretted…” – echoes 15:11 and God’s regret at the time of the flood, Genesis 6:7. This is not a conflict with 1 Sam. 15:29 where ‘will not regret’ in some versions means will not ‘relent’ or ‘change His mind’. Saul’s call to kingship had started well, 1 Sam. 9-10, but his character was to self-justify and on this test of how he had followed a very specific command he lied twice, 1 Sam. 15:3, 13, 20-22. Jesse was the grandson of Boaz and Ruth, of Bethlehem. Samuel had reason to be cautious – he had told Saul that God had rejected his kingship. Bringing a sacrifice gave Samuel a pretext for going to Bethlehem and following what the Lord would show him next. 5 Samuel replied, “Yes, in peace; I have come to sacrifice to the Lord. Consecrate yourselves and come to the sacrifice with me.” Then he consecrated Jesse and his sons and invited them to the sacrifice. “The Lord looks at the heart” – a much-quoted verse, which headlines a principle. The Lord is concerned with what is on the inside, i.e. character and spiritual disposition, whereas we are swayed by more evident attributes including appearance. Saul stood out in appearance and height, 1 Sam. 9:2, but in character he turned out to lack stature. 12 So he sent for him and had him brought in. He was glowing with health and had a fine appearance and handsome features. 13 So Samuel took the horn of oil and anointed him in the presence of his brothers, and from that day on the Spirit of the Lord came powerfully upon David. Samuel then went to Ramah. With v. 14 this is the pivotal moment when by this physical anointing there is a transfer of the spiritual anointing of God’s Spirit from Saul to David (which he recalled in worship, Psalm 51:11). It is the beginning of a long process over seven years in which Saul’s hold on the kingship is displaced by David’s growing influence. It is hard for us to grasp how, with foreknowledge, God can allow something to happen which then turns to failure. This makes a powerful statement about the principle of man’s free will, but also the seriousness with which God regards a failure of leadership through the wrong exercise of free will. In the O.T. the Holy Spirit comes on a person of God’s choice for a purpose, for them to step up to an anointed role e.g. as prophet or king or leader. In the NT the Spirit was given at Pentecost and all believers can ask and receive, and are later instructed to “be being filled”, Ephesians 5:18, in an ongoing way for an empowered ministry. The principle of “trust and test” applies to us as it did to Saul and David. Saul’s arrogant and self-justifying personality meant that he lacked the honesty to know his need of God and need to put right with God his mistakes. David made mistakes, but God had his heart – a crucial difference. We have free will to obey (or to take God at His word) or not. How have you grown through being tested on this? “A shoot… and plant it” – one of David’s line, Isaiah 11:1, Zech. 3:8, made king. A parable of a messianic future in sharp contrast to the destruction foretold in the preceding prophecies. “Birds of every kind” – people of every nation. 24 All the trees of the forest will know that I the Lord bring down the tall tree and make the low tree grow tall. I dry up the green tree and make the dry tree flourish. “Bring down the tall tree” – 1 Samuel 2:1-10, Isaiah 2:12-18. Trees represent the royal line. The pride and failure of David’s descendants would not stop God’s purpose for the dynasty of David, which was fulfilled in Jesus. Ezekiel was a later prophet who became one of the exiles and a contemporary of Jeremiah, Daniel and Obadiah. He had seen how king after king, and generation after generation, had rejected God’s ways – with disastrous consequences. He also caught a higher perspective: God’s purpose would be fulfilled by God’s action overruling man’s failure. When all around us appears hopeless, in the higher, heavenly perspective God is already bringing His good purposes about. 26-29 [Jesus] also said, “This is what the kingdom of God is like. The disciples thought the kingdom of God was a righteous political rule – looking back to David. Not so. All of Jesus’ teaching sought to demonstrate and explain how the kingdom of God, God’s rule and purpose, impacts man’s freewill existence. God’s kingdom exists and grows and produces its good effect in ways that are largely unseen and unrecognised – in our hearts, and through us as changed people, bringing God’s order in righteous, beneficial change to our world. “He also said” – Mark recounts some further seed parables which are about the hidden life of the kingdom of God which will appear. The kingdom of God is hidden, 4:21, but will certainly become established like a crop, and grow. “Like a mustard seed – the contrast between a very small beginning – the mustard seed was proverbially small – and spectacular growth. 33-34 With many similar parables Jesus spoke the word to them, as much as they could understand. He did not say anything to them without using a parable. But when He was alone with His own disciples, he explained everything. Mark shows that he is including a compilation of these parables, not a chronological account. This teaching reminds us that God’s kingdom does come and does grow whether or not we can see the impact of praying ‘Your kingdom come’. The change and growth keeps on happening “all by itself” as God’s will is done with the patchy support and partnership of His people. This teaching emphasises God’s sovereignty in fulfilling His purpose, but the witness of the Bible as a whole is on the way God chooses us to be His ‘executive partners’ through our lives and relationships. Heroes of faith like William Wilberforce and John Wesley whose hearts were changed by the Holy Spirit were passionate in their mission and persevering in setbacks and opposition and lack of progress. Centuries later, we see with more clarity what their prayer and persistence achieved for eternity. Can you recall something you have prayed for persistently without seeing change at the time – and then, looking back, you could see the shift? 6-7 Therefore we are always confident and know that as long as we are at home in the body we are away from the Lord. For we live by faith, not by sight. “At home in the body” – spiritual life is constrained by human existence. This is not an exhortation to be super-spiritual and believing the unbelievable, but rather living one’s whole life with God in a trust relationship which believes His promises and takes an eternal view, not just the immediate one. This looks back to 2 Cor. 4:18-5:1. 8-10 We are confident, I say, and would prefer to be away from the body and at home with the Lord. So we make it our goal to please Him, whether we are at home in the body or away from it. For we must all appear before the judgment seat of Christ, so that each of us may receive what is due us for the things done while in the body, whether good or bad. “Appear before the judgment seat” – in our courtroom language we speak of being ‘called to appear before the bench’. This was the bēma, where the Roman governor sat to deliver judicial verdicts. “Receive what is due” – there is judgment in heaven and we will have to give account for what we have done “in the body”, our here-and-now lives. Where we fall short of “living for Him” we should keep short accounts with God and others. 14-15 For Christ’s love compels us, because we are convinced that one died for all, and therefore all died. And He died for all, that those who live should no longer live for themselves but for Him who died for them and was raised again. “Christ’s love compels us” – Paul’s motivation is the strong awareness of the price paid for him by Jesus, and the relationship of love which holds him. The revelation of how Jesus loves us through His sacrificial death compels us to live for Him, not for ourselves. 16-17 So from now on we regard no one from a worldly point of view. Though we once regarded Christ in this way, we do so no longer. Therefore, if anyone is in Christ, the new creation has come: The old has gone, the new is here! This is a change of identity, from the old unregenerate person to the new, spiritual person. New creation also brings new perspective – we see things differently and the old, worldly point of view seems narrow and inadequate. The worldly view of Christ as a historical figure and perhaps a model to follow is radically overturned by the experience of the Holy Spirit Christ in us – and a growing understanding of who we are “in Christ”, our heavenly identity. There’s a tension in living for Christ and in the tension of the world’s ways, in being made a new creation person, but with a lot of old creation habits and attitudes hanging on. The life of the Spirit which is the context of this letter and others written to early church believers demands that we see ourselves as heaven sees us, and live up to this new identity. Too easily we slide back into responding to the world around us as we see it with our eyes rather than as we perceive it, drawing on the spiritual awareness given by the Holy Spirit. People let us down – that is what humans do. The worldly view will be condemning and judgmental; as those in Christ we are equipped to perceive what is going on in a person that impact us unhelpfully, and as those compelled by Christ’s love, we can choose to return to them the grace and forgiveness we ourselves have received from God. What excites you about the new life, in Christ as a new creation? What holds you back from experiencing it fully? “A king to lead us” – The leaders come up with a couple of insubstantial reasons for wanting a king, rather than a judge who would direct them to Yahweh; Samuel’s sons taking bribes, and the continual threats of the Ammonites and Philistines (v.20) did not help. However, the real reason will become clear. 6 But when they said, “Give us a king to lead us,” this displeased Samuel; so he prayed to the Lord. It was quite a rejection of Samuel, who had served them well. And another rejection – the Lord’s people of Israel were supposed to be distinct from the surrounding nations in doing things differently. “Rejected Me as their king” – meaning they had rejected God’s ways. This would be played out again with Christ. For further study, read Acts 3:13-15, 7:51-53. Samuel warns the people of the cost of taking this new direction, based on the practices of the Canaanite kings that surrounded them. 10-15 Samuel told all the words of the Lord to the people who were asking him for a king. He said, “This is what the king who will reign over you will claim as his rights: He will take your sons and make them serve with his chariots and horses, and they will run in front of his chariots. Some he will assign to be commanders of thousands and commanders of fifties, and others to plough his ground and reap his harvest, and still others to make weapons of war and equipment for his chariots. He will take your daughters to be perfumers and cooks and bakers. He will take the best of your fields and vineyards and olive groves and give them to his attendants. He will take a tenth of your grain and of your vintage and give it to his officials and attendants. “Take a tenth” – in reality, another tenth. Israel was instructed to devote a tenth to the Lord. The demands of an earthly king would double up on all the land, produce and people that would be consecrated to the Lord. “His slaves” – conscripted labour. Later widely used by Solomon. The motive becomes clear. God wanted all of them to be spiritually-led and spiritually dependent, as they were during the Exodus – but it was a tall order. The Israelites wanted to appear as a match for the nations around them, with a king as a figurehead, and to lead them in battle. 1 Sam. 11:14-15 Then Samuel said to the people, “Come, let us go to Gilgal and there renew the kingship.” So all the people went to Gilgal and made Saul king in the presence of the Lord. There they sacrificed fellowship offerings before the Lord, and Saul and all the Israelites held a great celebration. There they sacrificed fellowship offerings before the Lord, and Saul and all the Israelites held a great celebration. Meanwhile, Saul who came from a noble family and who looked the part, was anointed (on the Lord’s instructions) by Samuel and now receives his coronation. It is the start of a reign characterised by independence from God that would last for 40 difficult years. Kingship was allowed, but not required, by the law, Deut. 17:14-20. The people of God, Israel, had been commanded to be set apart for Him – to be holy, as He is holy. Therefore they were to follow His ways and uphold His values as distinct from the nations around. Yahweh led them out of Egypt and He led them through the desert with the visible presence of fire and cloud. But now they wanted a “king to lead us, such as the other nations have” and to “go out before us” in battle. This headlines the enduring tension between God’s way and man’s way that we all struggle with today. God’s way often requires a high level of listening and trust. We usually prefer to choose man’s more predictable way – and then spiritualise it. He just wants us to listen to Him, to be guided out of that relationship – and like Israel, to how His kingdom to others around us. Think of an example where you, or your church, seem stuck in “man’s way”. What would God’s way look like? “Out of His mind” – Jesus is acting strangely to His family; they were familiar with the ‘previous’ Jesus, the carpenter, and were still seeing Him in a worldly way. However, the evil spirits He confronted knew exactly who He was: The Son of God, Mark 3:11. 22 And the teachers of the law who came down from Jerusalem said, “He is possessed by Beelzebul! By the prince of demons He is driving out demons. The word about Jesus’ following has reached Jerusalem and a commission was sent to Galilee to investigate this ‘unauthorised’ rabbi. Threatened by a man who could do in the power of God what they could not do, they resort to slander, accusing Him of the exact opposite of the plain truth. Mark’s gospel doesn’t mention the blind and dumb demonised man, Matt. 12:22, Luke 11:14, that prompted the accusation that he was in league with Satan, Beelzebub, the prince of demons, John 10:20. 23-26 So Jesus called them over to Him and began to speak to them in parables: “How can Satan drive out Satan? If a kingdom is divided against itself, that kingdom cannot stand. If a house is divided against itself, that house cannot stand. And if Satan opposes himself and is divided, he cannot stand; his end has come. Jesus points out the ridiculous nature of their accusation. History teaches us that revivals bring opposition and the most bitter accusations are made by those who profess the same faith and should be on-side. 27 In fact, no one can enter a strong man’s house without first tying him up. Then he can plunder the strong man’s house. The strong man in this instance is tied and healing miracles are taking place. Jesus is demonstrably more powerful than Satan’s hold, strong though that may be. Jesus says that only one sin puts a person beyond forgiveness — attributing the redemptive work of God to Satan. This may be because a person locked in such prejudice is unable to make the turn of repentance – we have to acknowledge our need of forgiveness. Anyone who fears having committed the unforgivable sin has, by definition, showed the capacity to turn. Most likely His younger half-brothers, not believers at this time, not understanding Jesus’ call and identity and concerned that He was overreaching Himself. Sisters are mentioned in Mark 6:3. Joseph, not mentioned, has probably died by this time. This opposition to Jesus started in the place of supposed faith, the synagogue, with the healing of a man with a malformed hand. Then a crowd followed Him as He made Himself less prominent and brought with them a deaf and dumb man, who was most evidently healed. This was a power encounter in which evil spirits manifested and clearly knew exactly who Jesus was – the Son of God. But His own family were fazed by this and Jewish religious leaders present were critical in the extreme. Why would they attribute the unmistakable, and unarguably good, healings of needy people to the work of the chief of demons, or Satan? This was true blasphemy of the most serious kind. By contrast, Jesus was frequently accused of blasphemy by religious people. This gives us a clue. The religious spirit, where man defines what is correct or right, brings out deep-seated and irrational prejudice. It’s hard to turn from a mind-set like that, and so it is hard to receive forgiveness for it. It is common today for a misplaced sense of ‘religious correctness’ to be a real barrier to the Good News and God’s work in a church or congregation – something we learn from this story. Where have you found an unfamiliar teaching or an experience of God at work difficult because of your own prejudice or sense of what should or shouldn’t be? 13-14 It is written: “I believed; therefore I have spoken.” Since we have that same spirit of faith, we also believe and therefore speak, because we know that the One who raised the Lord Jesus from the dead will also raise us with Jesus and present us with you to Himself. “I believed… I have spoken” – Paul quoting a version of Psalm 116:10. Exercising faith leads to testimony stories, big and small; testimony is a powerful way to raise faith in others. Paul often told the story of being changed from persecutor to missionary by his encounter with Jesus. “Present us… to Himself” – the Holy Spirit’s extraordinary power resurrected Jesus, Romans 8:11, 1 Cor. 15:20. His transformative power is at work in us to present us, made holy and acceptable, to God. A trinitarian saying. Being renewed” – the Holy Spirit’s resurrection life is always renewing us inwardly (and us together as the Church). The more the outward testing – for Paul, this was sometimes brutal – the greater our reliance on God, and the deeper the relationship with Him. “Light and momentary” – Paul’s irony, but a reminder that as our life is eternal, our perspective should be also. Developed in the following verse. 2 Cor. 5:1 For we know that if the earthly tent we live in is destroyed, we have a building from God, an eternal house in heaven, not built by human hands. “Earthly tent” – a tent or even marquee has a limited life. For all of us, earthly life lasts… until it doesn’t last any more. But the reality is a heavenly life more permanent than a castle. Paul is speaking from a perspective of experiencing “light and momentary troubles”. Either this is an unusual and early use of the classic English understatement – or Paul, who is being hammered physically, emotionally and spiritually, is teaching us about keeping a heavenly focus when hell seems to be breaking out. The more up-front we are about declaring and living in the Lordship of Jesus, the more the forces of darkness will try to throw us off or discourage us into backing away. Paul’s teaching is that spiritual opposition (which often comes through people as other kinds of opposition, attacks on health and in every other way) is par for the course and “momentary”. The gains are eternal. We only see our side of the battle, not the “eternal glory” that results, and the difficulty we experience is temporary, but the results – a person led to Christ, for example – are eternal. “Keep on keeping on”, he seems to be saying, even if our “tents” seem to be in danger of collapsing in the gale. p class=”p1″>What is your story of pressing in spiritually – perhaps in prayer for a situation – and feeling the kickback of the enemy’s oppression? How long-lived was this?